Offering you a complete choice of products which include squash court refurbishment. 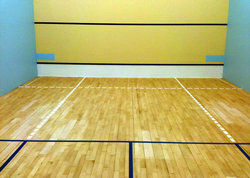 Sundek Sports Systems is engaged in refurbishing of Squash Court. Squash is a racket sport played by two (singles) or four players (doubles) in a four-walled court with a small, hollow rubber ball. The players must alternate in striking the ball with their racket and hit the ball onto the playable surfaces of the four walls of the court.